In the last couple of months, Sharp has released three new smartphones in Europe – they are the Aquos B10, Aquos C10, and the Aquos D10, and all three phones are mid-rangers. There is a possibility it has a special flagship phone for Europe coming soon which is different from the Aquos R2 it launched in Japan earlier this year. The phone was seen at IFA 2018 and there are rumors it may even launch next week in Japan before heading back to Europe. The Sharp phone whose model number is 801SH is codenamed “Johnny”. It has a 6.2-inch flexible OLED display with a 3120 x 1440 resolution. There is a wide notch at the top but sadly doesn’t house more than a front-facing camera and the usual sensors. This is a bit disappointing as all that space could have housed an advanced face unlock system. The Sharp 801SH is powered by a Snapdragon 845 processor with 6GB of RAM and 128GB of storage. Unlike the Aquos R2, which has dual rear cameras, this Sharp flagship has just a single camera on the rear. It is a 23MP sensor and it sits in the middle of the device. There is a fingerprint sensor below the camera setup. The battery capacity of the phone isn’t known and so also is the pixel count of the front-facing camera. One thing that is known though is that the phone is running Android 9 Pie. While the Sharp 801SH does pack flagship specs, it has an interesting design. The display not only has a notch but it curves on the sides giving it a very premium appearance. 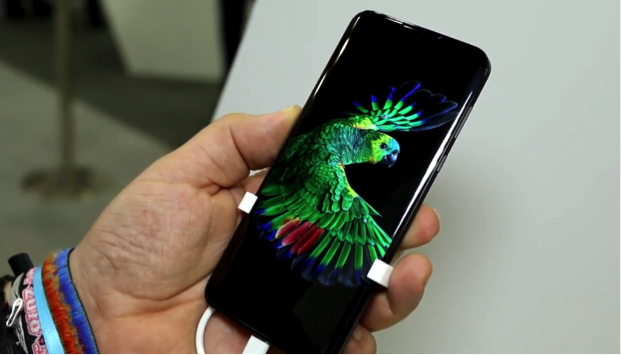 For a flagship phone like this, you’d expect it to have a glass or at least metal back but Roland Quandt who had a hands-on experience with the phone says it’s covered in plastic.The premium smartphone market was 79.3% of overall smartphone revenue in2017, which makes it a major focus of almost all smartphone vendors, since Apple and Samsung Electronics have always dominated the premium market. Over the last year or so however, a number of Chinese smartphone brands, previously focused on low to mid-priced markets, have begun to release premium smartphones, and have been encroaching on the “big 2”. But with premium smartphone prices exceeding $1,000, consumers are extending the upgrade cycle. Chinese smartphone brands that have three of the top five smartphone shipment slots are moving up from their low and mid-priced roots to compete in the premium segment, but they appear to be doing so by offering more features at lower cost than the “Big 2”.